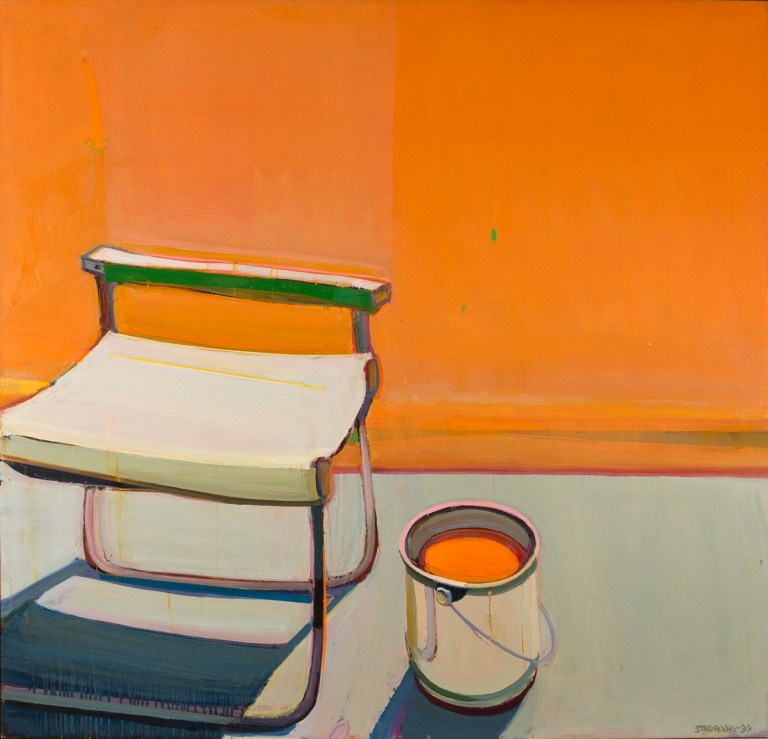 Raimonds Staprans, Still Life with the Uncomfortable Chair, 1991. Oil on canvas, 46 x 48 in. Crocker Art Museum, gift of Ilona and Raimonds Staprans. 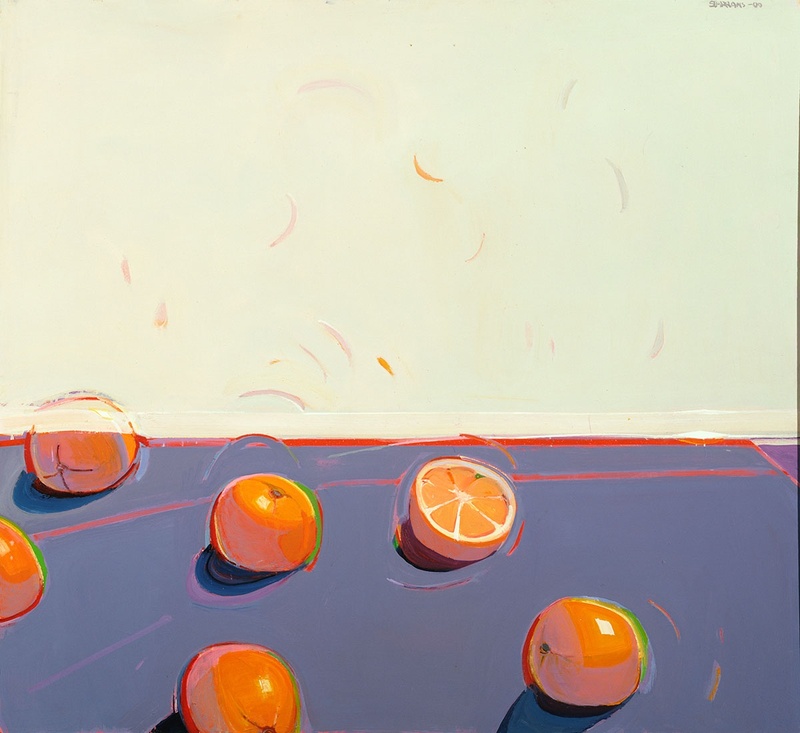 Raimonds Staprans, Four Windswept Oversize Oranges, 2000. Oil on canvas, 44 x 48 inches. The Glass Family Collection. Born and raised in Riga, Latvia, Raimonds Staprans has lived in Northern California for more than six decades — nearly his entire career. He has often claimed that in terms of his education, experience, and personality, he is thoroughly Latvian, whereas his paintings are purely Californian. Many of his paintings showcase the landscape and architecture of the Golden State, having an equal basis in reality and the artist’s imagination. Taut contours and bold hues define fields, marinas, isolated trees, and architecture, all devoid of people, while scorching sunlight descends from skies of the deepest blue. His still lifes of fruit, artist materials, and chairs share this pervasive loneliness, quality of light, and rich color — sometimes including a full prismatic spectrum. In all of Staprans’ work, assertive brushwork and traces of revision are ever present, reminding viewers that his realities are purely paint on canvas, his subjects formal elements in his process. Full Spectrum: Paintings by Raimonds Staprans will be accompanied by an extensive, full-color catalogue with essays by Paul J. Karlstrom, art historian and former West Coast regional director of the Smithsonian Archives of American Art; David Pagel, art critic for the Los Angeles Times and chair of the Art Department at Claremont Graduate University; Nancy Princenthal, writer and art critic; Ed Schad, associate curator at The Broad, Los Angeles; John Yau, art critic and poet; and Scott A. Shields, associate director and chief curator at the Crocker Art Museum. Check out our calendar of events for additional programs related to this show.